Two former bank chief executives are attempting to block the £12bn takeover of HBOS by Lloyds TSB, saying it should remain independent. 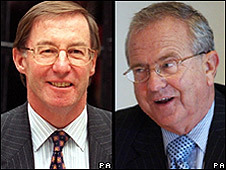 Sir Peter Burt, formerly of the Bank of Scotland, and Sir George Mathewson, ex-head of the Royal Bank of Scotland, say they should be appointed to lead HBOS. Sir Peter said a takeover would leave HBOS shareholders and staff worse off. But HBOS said the men's plan offered no value for its shareholders and it could see no grounds for further talks. In a letter to HBOS chairman Lord Dennis Stevenson, Sir George and Sir Peter called for his immediate resignation and that of the bank's chief executive, Andy Hornby. This, they said, would allow them to take over temporarily as chairman and chief executive and put in place a plan to keep the bank independent. "The black horse has got two broken legs," he said, referring to the company's symbol. "It's a fantastic deal for Lloyds but it's not a good deal for anybody else." But HBOS said a "well-developed deal" with Lloyds TSB was on track, that provided certainty to its shareholders and real financial benefits. In contrast, Sir Peter and Sir George had not put forward a substantive offer for HBOS, the bank said. Its chairman Lord Stevenson has written a formal reply to the pair, saying his board sees "no basis for future discussion". Shane O'Riordain, head of communications at HBOS, said the men were not offering shareholders anything - no cash, no value nor any certainty. "All they are simply saying is they would come in and run the company instead," he added. "Together with Lloyds TSB we will be a stronger group, a group in a better position to access funding and... after all funding is the lifeblood of any bank." Lloyds TSB has said its acquisition of HBOS would save it at least £1.5bn ($2.4bn) a year, raising fears of heavy job losses from the merger. The letter-writers argue HBOS no longer needs to be rescued by Lloyds TSB, because the government and Bank of England have offered vital funds to replace those that could be withdrawn by money managers and other creditors. "It is our intention to create a detailed alternative plan that we believe will represent better value for both the HBOS shareholders and stakeholders alike by keeping HBOS as an independent bank," their letter says. Speaking from his Perthshire home, Sir George said: "We do not believe the alternatives to the Lloyds takeover of HBOS have been properly explored. "And, that this deal was conceived in response to a particular problem and then the world changed a week later. "As such that deal is no longer the proper deal for the shareholders of HBOS or anybody else." Sir Peter added: "Why would the government want to push through a merger which the Office of Fair Trading has said is against the public interest; jobs will be lost north and south of the border; it is anti-competitive; it is not good for staff; it is not good for customers; and it is not good for shareholders?" BBC business editor Robert Peston said the pair would now canvas shareholders to try to requisition an emergency meeting to have Lord Stevenson and Mr Hornby removed. The intervention by Sir Peter and Sir George will be difficult for the board of HBOS to ignore, not least because the former is credited with creating HBOS. 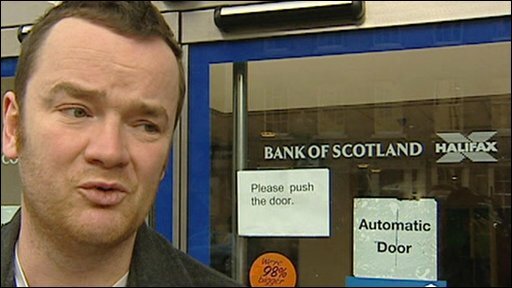 He was chief executive of Bank of Scotland when it merged with the Halifax to form HBOS. An HBOS spokesman said their proposal assumed the government capital would be on offer to them. A Treasury spokesman said the merger with Lloyds TSB was still on course. "In the real world nothing has happened yet," he said. "Unless parties formally change their minds, then this merger with Lloyds will go ahead." In relation to the £17bn taxpayer bail-out of HBOS, the spokesman said the government would have to "look again at any taxpayer support if the merger didn't go ahead". The BBC's Robert Peston said he sensed the Treasury was not keen on putting more taxpayers' money into HBOS and the odds of the two men pulling off their plans were "very slim". He said the chancellor, Alistair Darling, had already made it clear he was not enthusiastic about HBOS operating as a stand-alone business and Gordon Brown was not likely to abandon his backing for the Lloyds takeover. A copy of the letter was also sent to First Minister Alex Salmond, who said he would give what it had to say "the most careful consideration". He said: "They are the two outstanding figures in the Scottish financial sector over the last generation, and therefore their views command great respect." The Scottish National Party has been highly critical of the takeover. There are 17,000 jobs at stake in Scotland and it has become a highly-charged political issue. Mr Salmond emphasised all propositions on the future of HBOS would be considered in terms of the best interests of Scottish jobs, business, personal customers and the wider Scottish economy. Q&A: Are my savings safe? Have bail-outs worked in the past?